I protect the Galaxy from the Evil Emperor Zurg, sworn enemy of the Galactic Alliance! Some of us, like Woody, have laser envy. The first time we saw Buzz Lightyear pop out of his packaging, we were the jelliest jelly beans to ever jelly. That is, we really wanted to be Buzz Lightyear. We wanted to have a space suit. One with wings that pop out. We wanted to have an evil nemesis named Zurg. And we wanted to be able to fly like Buzz. 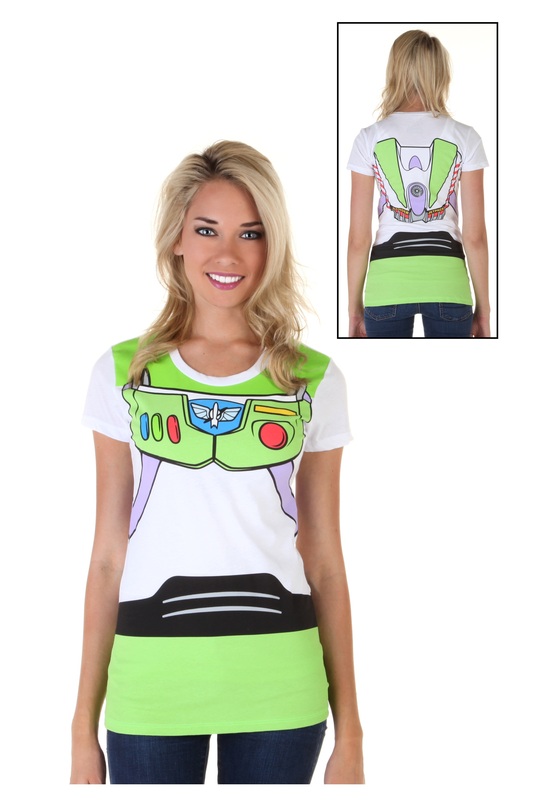 This Women's Toy Story Buzz Lightyear Costume T-Shirt might not give you all the abilities of Buzz, but you can pretend. And let's be honest, that's all Buzz was doing himself. Just try not to have a melt down, drinking copious amounts of Darjeeling tea at noon, when you realize that it is all pretend. We will find Woody to snap you out of it if we have to. Good quality and very fast shipping! !